China launched its second Long March-5 (Chang Zhen-5) rocket on Sunday carrying a super-heavy experimental communications satellite. 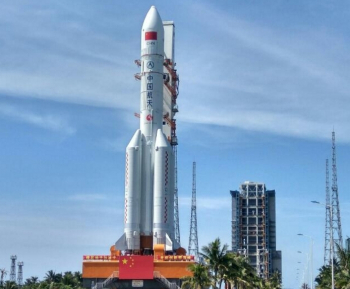 The launch took place at 11:23 UTC from the Wenchang Space Launch Centre’s LC101 dedicated Launch Complex. However, with the Long March-5, carrying the Shijian-18 satellite, suffered an unspecified failure during what was only its second flight. 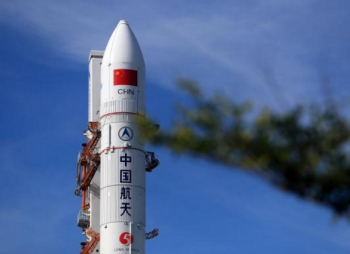 The launch was part of a shakedown period for China’s new rocket, which is set to play a major role in Lunar and Mars missions. Issues with the launch were not immediately known, with commentators claiming all was fine with the launch, including a message of mission success after spacecraft separation. 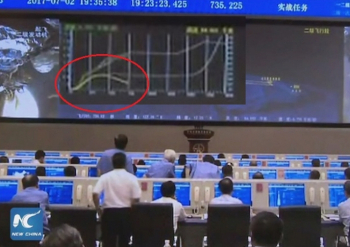 However, and as observed during the coverage, parameters were becoming off nominal early in the flight. Official media then called the mission a failure less than an hour after the launch was conducted. This was a rare live broadcast of a Chinese launch and it will likely result in pressure to further remove the Chinese rockets from international attention. Per the mission, this launch also had the primary goal of lofting a new satellite into orbit. 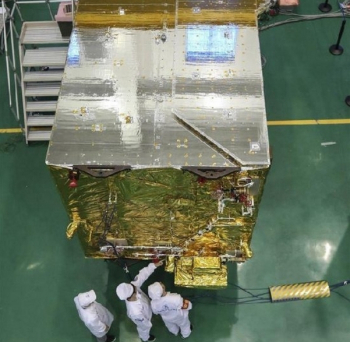 The new Shijian-18 experimental communications satellite is based on the new DFH-5 satellite platform, developed by CAST (China Academy of Space Technology) of China Aerospace Science and Technology Corporation (CASC). The DFH-5 satellite platform is a large trussed satellite platform of new-generation with a launch mass of 8000 kg, payload of 1500 kg, providing 18 kilowatts payload power, high load, high power, high heat dissipation, long life, scalability, etc., using a truss structure, high power distribution systems, advanced electronics and integrated multi-mode high-thrust electric propulsion and other advanced technology to meet the needs of communications and other devices. The development of the DFH-5 platform will lead the technical innovation of the design and manufacture of spacecrafts and other relevant areas, promoting the upgrading of large satellite platform, supporting the development of civil space infrastructure and aerospace equipment, and creating new advantages in international commercial satellite market competition. The new satellite would have used ionic propulsion system to reach the geostationary orbit. The LIPS-300 ion thrusters will also be used for orbital maintenance operations. However, this satellite’s only destination will now be a watery grave. Aiming the capability to have a space launcher capable of orbiting heavy cargo to the Geostationary Transfer Orbit (GTO) or to Low Earth Orbit (LEO), China approved the development of the Long March-5 family of launch vehicles on June 2004. The new launcher family would meet the needs in the future launch service market, would be used to launch the modules for a large-scale space station, would help to maintain the development trend of China’s launch vehicle technology, and drive the development of economy and related high-techs in China with the development of new rocket engines, new welding techniques, upgrade the fight control systems, etc. The new development program would design a series of launch vehicles rather than one launcher made for a specific mission. 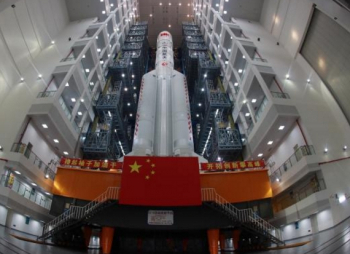 This is to enhance China’s capability of accessing space; would apply advanced technologies, such as the large diameter core and the powerful thrust engine to increase the launch capacity dramatically, with the goal of launching 25-ton payloads to LEO and 14-ton to GTO; design a series of launch vehicles based on the principle of generalization, serialization and modularization, with the purpose of meeting the needs of launching different payloads; to use non-toxic and non-polluting propellant; and to be low cost, high reliability, and convenient for test and operation. The launcher system envisioned a modularized concept using two newly developed engines and three standard modules. Originally the plan included three primary classes: 5-meter diameter core variants, a 3.35-meter diameter core variants and a 2.25-meter diameter core configuration. The three standard modules were the H5-1 module (5 meter diameter with a length of 31.0 meter and equipped with two 50t LH/LOX engines, having a mass of 175t), the K3-1 module (3.35 meter diameter with a length of 26.3 meter and equipped with two 120t KO/LOX engines, having a mass of 147t) and the K2-1 module (2.25 meter diameter with a length of 25.0 meter and equipped with one 120t KO/LOX engines, having a mass of 69t). From these initial concepts, the Long March-6 and Long March-7 launch vehicles were developed. A series of variants were proposed for the heavy launcher. Using the 5 meter diameter core stage and different combinations of strap-on boosters and an upper stage, six variants were proposed to achieve different payload capacities. Configuration A would be able to launch 18 t to LEO, while Configuration B and C would be capable of lofting 25 t and 10 t to LEO, respectively. For GTO the Configuration D would be capable of launching 10 t, while the Configuration E and F would be capable of lofting 14 t and 6 t to GTO, respectively. Eventually, only two variants were developed: the basic variant two-stage Long March-5 designed for GTO missions, and the single-stage Long March-5B designed for LEO missions. Both variants are fitted with four strap-on boosters of 3.35 m diameter. The basic variant of the new launcher is a two-stage core vehicle (5 meter diameter) with four strap-on boosters (3.35 meter diameter). The vehicle is capable of launching 14,000 kg to GTO. Total length is 56.97 meter, gross mass of 869 t and lift-off thrust of 10,573 kN. 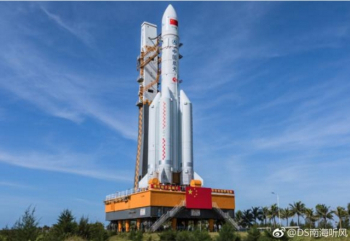 Inaugural flight was schedule for 2013, but the China Academy of Launch Vehicle Technology (CALT) and the Shanghai Academy of Spaceflight Technology (SAST) would have to endure a hard road to the first flight. Facing enormous technical challenges, the development of the YF-100 and YF-77 engines would delay the development of the new launch vehicle family. Total length is 56.97 meters and gross mass is 869,000 kg, developing a lift-off thrust of 10,572 kN. First stage length is 31.02 meters, with a 5.00 meter diameter. The first stage is equipped with two YF-77 engines consuming LOX/LH. The first stage has a gross mass of 175,800 kg with an empty mass of 17,800 kg. 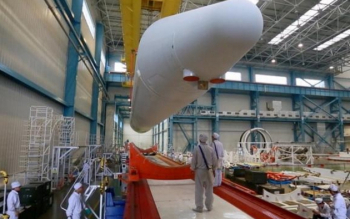 The strap-on boosters have a length of 26.28 meters and a 3.25 meter diameter. Each strap-on booster is equipped with two YF-100 engines. Gross mass is 147.000 kg with an empty mass of 12,000 kg. The YF-100 consumes LOX and kerosene. The second stage is 12.00 meters long, with a 5.00 meter diameter. Is equipped with two YF-75D engines, consuming LOX/LH. 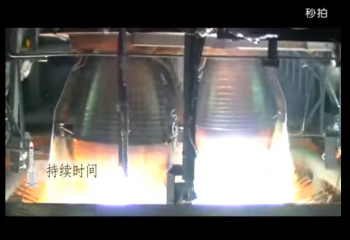 The second stage has a gross mass of 26,000 kg with an empty mass of 3,100 kg. The YF-77 engine, developed by the Academy of Aerospace Launch Propulsion Technology (AALPT) is a high performance and reliability booster designed for the Long March-5 family. This is the first high-thrust cryogenic engine developed in China, taking a big technological step with respect to previous Chinese cryogenic Oxygen/Hydrogen engine, such as YF-75 which powers the LM-3A/3B’s upper stage. The engine utilizes gas generator cycle with cryogenic LOX/LH2 propellants. Two YF-77 engines fly on the first stage of the Long-March 5 and each engine provides 700-kN in vacuum at an oxidizer-to-fuel mixture ration (O/F) of 5.5. The YF-77 develops 700 kN at vacuum and 510 kN at sea-level with a Isp of 430 seconds (vacuum) and 310.2 seconds (sea-level). Burn time is 520 seconds. The YF-100 development began in 2000 at the Academy of Aerospace Liquid Propulsion Technology. The engine was certified by the State Administration of Science, Technology and Industry for National Defence (SASTIND) in May 2012. It is a staged combustion cycle engine developing 1,199.19 kN at sea-level with a Isp of 300 seconds (vacuum values are: thrust 1,339.48 kN; Isp 335 seconds). Burn time is 155 seconds. The YF-100 is also on the CZ-6 launch vehicle. The YF-75D engine is a LOX/LH2 closed expander cycle engine the is designed to meet the requirements of second stage propulsion of the new generation LM-5 launch vehicle for its performance, reliability, developing cost, schedule, etc. YF-75D engine is capable of throttling its mixture ratio and multi-start, so that it will be suited to various missions. YF-75D engine has two turbopumps driven by gaseous hydrogen. They are designed in series and gimbaled with the whole engine. The YF-75D develops 88.26 kN at vacuum with a Isp of 442 seconds. Burn time is 780 seconds. The cargoes orbited by the LM-5 are initially protected by a payload fairing with a 5.2 meter diameter and a 12.5 meter length. 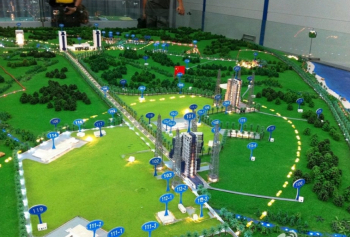 With the first orbital flight taking place on June 2016, Wenchang Space Launch Centre is located in the northeast corner of the Hainan Island on the southern coast of China. The new launch complex brings a more large versatility that isn’t provided by the other three launch sites. Wenchang provides an increase in performance for the launch vehicles gained from the Earth’s rotational speed because is closer to the Earth equator. This reduces the amount of propellants required for the satellite’s maneuver from the transit orbit to GEO. The launch vehicle can fly from the launch site to the southeast direction into the South Pacific, avoiding the possibility of rocket debris falling into any populated area. The launch pads at the new launch complex use a sound suppression system, spraying large volumes of water at the launcher platform and into the flame deflector trenches below to dampen sound waves generated by the rocket engines. The launch pads are served by two vehicle assembly and integration buildings. Launch Complex LC101 is served by Building 501 while Launch Complex LC201 is served by Building 502. Each building is 99.4 meters tall permitting the assembly and testing of the launch vehicle in a full, vertical stacked position. This is a new approach to the launch vehicle preparation for flight, because at the other Chinese launch centers the launchers are stacked and tested for flight at the launch platforms. After being stacked at the vehicle assembly and integration building at the top of a mobile launch platform, this is the rolled to the launch pad. The journey takes several minutes to cover the 2,800 meters separating the vehicle assembly and integration buildings, and the launch pads. After arriving at the launch pads, the mobile structure is then placed above the flame trench and the necessary umbilical connections between the fixed structures and the mobile platform are established.